1915. The dawn of the hydroelectric power era in Niagara Falls. Seventeen-year-old Bess Heath has led a sheltered existence as the youngest daughter of the director of the Niagara Power Company. After graduation day at her boarding school, she is impatient to return to her picturesque family home near Niagara Falls. But when she arrives, nothing is as she had left it. Her father has lost his job at the power company, her mother is reduced to taking in sewing from the society ladies she once entertained, and Isabel, her vivacious older sister, is a shadow of her former self. She has shut herself in her bedroom, barely eating-and harboring a secret. The night of her return, Bess meets Tom Cole by chance on a trolley platform. She finds herself inexplicably drawn to him-against her family’s strong objections. He is not from their world. Rough-hewn and fearless, he lives off what the river provides and has an uncanny ability to predict the whims of the falls. His daring river rescues render him a local hero and cast him as a threat to the power companies that seek to harness the power of the falls for themselves. As their lives become more fully entwined, Bess is forced to make a painful choice between what she wants and what is best for her family and her future. All of the elements are here…a sweeping love story, the struggle for acceptance, the challenges that family dynamics present…all amid the raging backdrop of the Niagara Falls. Lush and full of life. Fans of historical fiction will enjoy this one. Every time I opened this book, I felt as if I were stepping off of the page, right into the Niagara. I could feel the mist upon my face, the powerful tug of the current and I could hear the roar of the water as it plunged over the falls. I love it when a novel can transport you to another time and place. 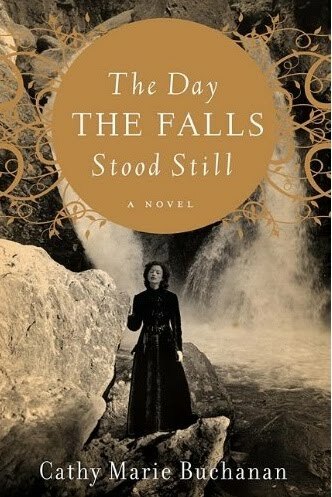 In addition to its glorious setting, this novel also deals with class struggle, the environmental impact of hydroelectric power upon the falls, and the effects of war. This novel is unique, well paced and well thought out. I appreciate the tenderness of the characters, and by that I mean that they are strong, yet vulnerable and I find that I can easily relate to them at different points of the story. Overall, a very enjoyable read. The Day The Falls Stood Still was chosen as a Barnes & Noble Recommends pick and just made its debut on the New York Times Best Seller’s list! If you’d like to read more about Cathy Marie Buchanan, click here to visit her website. Check out the rest of Cathy’s tour stops here. To purchase the book, please visit Amazon, Barnes & Noble, Powell’s or an independent bookseller of your choice! Cathy Marie Buchanan will be stopping by Book Chatter and Other Stuff on Thursday, September 10th for a Q&A session. Come back for that, and there might be a little surprise to go along with it. Thanks to Cathy and Diane for providing me with this review copy. I also loved this story Ti…thanks for the review. I LOVED this book; the cover is amazing too. It was hard to believe Cathy B is a debut author; very talented indeed. I love books that can transport you to other times and places as well. This one sounds fabulous – I can't wait to read it. I am glad to hear you enjoyed it, Ti. I've been wanting to read more reviews of this one as it sounds like it would be good. Your review definitely makes me want to give it a try. I've been to Niagara Falls a couple of times and it really is a magnificent place. This one sounds good. Thanks for the review! I've heard nothing but good things about this book. I'm so glad it's on my desk waiting to be read. Great review, Ti! Nice review! I look forward to reading this book at some point in the future. It sounds like something I would really enjoy. Fantastic review!! I must read this book…it sounds perfect for me! I'll be back on Thursday! We went to Niagra Falls for our honeymoon (Canadian side) and it was my favorite vacation. I would love to be able to read a novel that brings me back to that time. Thanks for the great review, Ti! Hmmm, maybe I need to start stalking your book choices! This sounds good! Okay, I wanted to read this anyway so now I'm trying to talk my book club into reading it. It should be an easy sell; everyone loves it! I'll have to read this one. Thanks for the review. Thanks for the review. The backdrop of the story sounds really good. I have this on in the TBR stack, so I'm going to come back and read your author interview when I'm done with it. Glad to know you enjoyed this!